Male bust, cut off at the chest. The portrait features a young man with the head slightly turned to right. The rather bold face is characterized by slanting eyes, hooked nose, full, tight lips and receding chin. 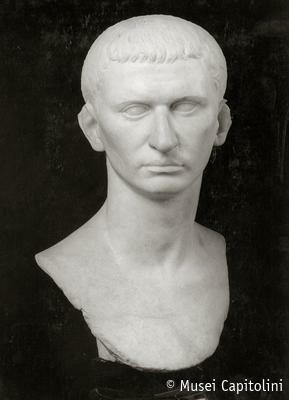 The hair, neatly arranged in short locks pointing to right, closely follows the shape of the skull and recalls the hairstyle associated with portraits of the emperor Tiberius which were created on the occasion of his official adoption by Augustus. This bust, datable to the Tiberian age, was purchased for the Capitoline Museum from the collection of the cardinal Alessandro Albani in 1733.